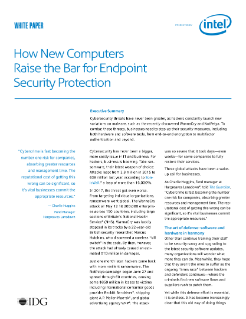 This endpoint security protection white ...paper outlines the components of an efficient and effective cyber security solution that starts at the endpoints. • They strengthen user authentication to curb hackers using stolen credentials— still the main cause of data breaches. • They protect data, even when it’s used by an increasingly mobile workforce, outside the company perimeter and firewalls. • They make it easier for organizations to recover from attacks by quickly isolating infected devices. When companies simply update the security software on their devices, they essentially change the locks on the doors. That helps, but it doesn’t address the real problem: It’s easier to pick or bypass a lock than it is to break down a reinforced steel door. In the case of endpoints, silicon is the steel, and upgrading to new devices with Intel® Authenticate and Intel® Data Guard reinforces corporate doors. Upgrading to new devices powered by latest generation Intel® Core™ vPro™ processors doesn’t only improve performance, it offers businesses an entire platform of hardware-enhanced security solutions.